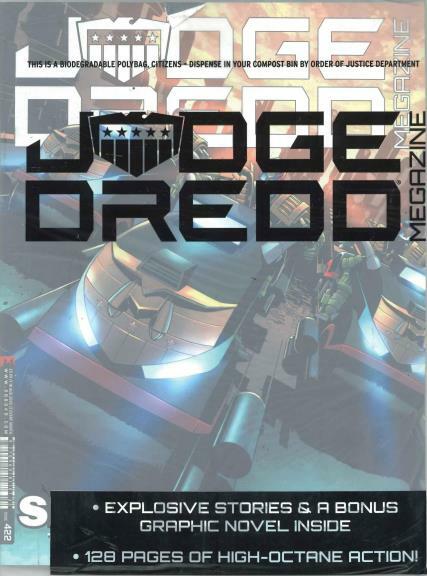 Judge Dredd Megazine is a spin-off magazine to 2000 AD featuring Judge Dredd and other characters from his world. Buy a single copy or subscription of Judge Dredd Megazine. Judge Dredd Megazine is published monthly and was launched in 1990. The title, “Judge Dredd “Megazine”, is a play on words combining “magazine” and the name of Judge Dredd’s home “Mega-City One”. The story features, Joseph Dredd, the toughest Judge in the city of Mega-City One with the powers to instantly convict, sentence, and execute offenders. Each issue features action-packed stories from both Judge Dredd’s world and others including Anderson, Havn, The Dark Judges and more. Plus, find all the latest news and interviews from the world of comics. This is an award-winning magazine which is extremely popular in the UK. Judge Dredd Megazine has been a proud recipient of a number of awards like the UK Comic Art Award, Eagle Awards and many more.